At open house night, when your child heads back to school, many teachers ask that families read with their children 30 minutes per night. 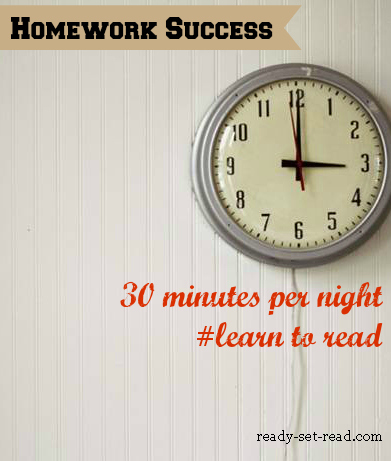 For new literacy learners who can't read independently, it can feel difficult to fill 30 minutes with reading. Many early readers sound like robots who need a tune up. They drag. out. every. single. syllable. in. every. single. word. Reading time can be torture for parents. Reading homework time doesn't have to be torture! In 30 minutes per day, families can enjoy sharing wonderful picture books, hearing their child read successfully, studying spelling words, and creating original stories with their children. 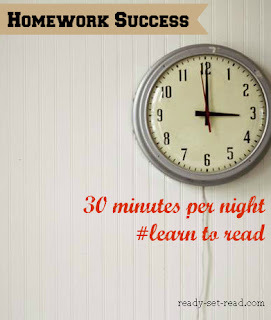 By following my after school 30 minute rockin' plan, your child can be on the way to reading success. And come back tomorrow for more freebies! A child needs to hear 1,000 books read aloud before they will learn to read independently (From Mem Fox, "Reading Magic"). It sounds like a lot! When you consider that if you read just three books per day, your child will hear over 1,000 books in just one year! Even when your child begins to read independently, it's important to continue to read books aloud to your child. Make it a goal to read at least 3 books per day. Try to incorporate fiction, nonfiction, poetry, and nursery rhymes. Don't know which books to choose? Try some of our favorite picture books, or choose a book for a holiday that is coming soon. Many teachers will send home books on your child's level. If your child's teacher has not sent home any books, ask the teacher for help in locating a book on the appropriate level. The reading should sound fast and fluent-- just like a grown up would read. If your child reads word by word and sounds out every.single.word, the book is probably too hard. (Do a happy dance now... I'm giving you a break from torturous slow reading) It is fine if the child re-reads the same book several nights in a row. Rereading a book helps the child to pull together all of the skills it takes to read, as well as build fluency. Depending on the grade level and classroom, your child may or may not have a spelling list. It's great to spend time each night working on spelling words, but it's also important for children to study words and work with words and letters. For very early readers, work on quick recognition of letters. Begin with the letters in your child's name. Provide young learners with magnetic letters on the fridge. Have the child sort letters by color or letter feature. Here are 10 easy letter sorts. You can also work on phonics skills. Check out my pinterest boards for ideas on beginning letter sounds, rhyming words, and sight words. I'd love if you'd follow me on pinterest while you are there! Consider having your child keep a journal at home. When your child doesn't have assigned homework, he/she may choose to write in a journal. At first, your child's writing will probably just be pictures. Provide your child with a bound journal of blank paper. As your child progresses, he may want to try adding words or labels to his pictures. Have your child re read his own writings from previous days as well. Often the first pieces of writing your child can read independently is something he/she has written. Help your child learn how print works by building sentences. Once your child is able to write sentences independently, choose a sentence. Write the sentence on a strip of paper and cut the words apart. See if your child can reconstruct the sentence. This requires looking closely at words and understanding how print works. Cut off the punctuation. Does your child know where to put a period? Have your child point out the first word in the sentence, the last word in the sentence. Have your child construct the sentence in a confined space so the words must flow to the next line. Ask your child to read to the end of the line. Ask, "now where do we go?" Some children may need additional help in learning to read that goes beyond the instruction they are receiving the classroom. Other children may be working at a much faster pace than their classmates. Parents may want to provide instruction at home to supplement the classroom instruction and move their advanced child on a more appropriate path. 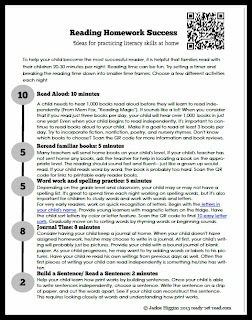 It can be helpful to use a premade curriculum to save you time at home. There are two reading curriculum that I love. Both of these can be used no matter what level your chils is working on. You can easily find the appropriate level and work from there to accelerate your child's learning.These are affiliate links. Blue Manor Academy-- curriculums for preschool and kindergarten plus topical ebooks. Click to read my review of the program. Ready-Set-Read Store- I also have printable activities available in my teachers pay teacher store. Many of them are free and will help you during your reading homework time. If you found the ideas in this post helpful and would like to share them with parents, I have provided a one page handout giving some of the basic information about easing first day worries. This would be a great handout to provide to parents at open house. There is a QR code provided on the handout. Parents seeking additional information can scan the code and find this blog post. Click to get your free printable on google drive. Do you practice reading and other literacy skills after school? What tips can you share? Great list, Jackie! Pinned it! Love it! I love the breakdown of the 30 minutes. This will be very helpful for my son who sometimes struggles with attending to one task for too long! Thanks for sharing on the KBN Back-to-School blog hop! Thanks for your comment on ready-set-read.com. My son also has trouble just "reading" for 20 whole minutes. Breaking it down makes it more enjoyable for him... and for me! Thanks for stopping by! I really like your breakdown - a lot can accomplish in 30 minutes a day, and even working parents can find time if they really want to help their children succeed. We still struggle with desire to write here, but perhaps this approach will help. We actually struggle with the writing too. Logan's hardest area is fine motor skills. I think for some kids, when other things come so easily, it's hard to sit down and do something that seems "hard" for them?